or from $10 per week and 0% interest. Limited Easter Packages Available. Only 1 Left! If you’re serious about keeping chickens, and you’ve got the room for it, the Mansion™ and Double Run package is all you need to home your chooks in the luxury they deserve. After all – they give you fertiliser, affection and eggs, it’s only right to ensure they’re secure and comfy too. The organic and self-sufficiency movement has seen more people in Australia discover the joys of chicken keeping and collecting their own freshly laid eggs. This stylish coop brings a touch of class to that lifestyle, while placing function at its forefront – walk-in sizing, lockable doors and nesting boxes, best-in-class ventilation and slide-out cleaning trays – it’s all designed to make chicken keeping a breeze, and looks great doing it. 8 x perches = 8m of perching space! Egg collection is convenient and comfortable for you and your chickens! Featuring 6 large nesting boxes, a flock of up to 20 hens will be able to lay their eggs in private comfort within the Mansion™ and Double Run. The external nesting box lids give you easy access to your fresh backyard eggs. Keep your hens happy and well-rested with 50mm round perches, perfectly designed to suit your chickens’ feet. Roosting and resting is easy for your flock with 8m of perching space in the Mansion™ and Double Run. • Our coops feature A-grade, kiln dried timber to ensure they last and help withstand the harsh Australian climate. • The proof is in the weight. Our coops weigh up to three times more than others on the market. Our chosen timber and its strength and durability lets us comfortably offer a full 12 month warranty. • Your coop will arrive natural, ready to be painted & styled your way! Painting your coop with quality exterior paint will provide the superior long lasting finish you want & for warranty purposes. • Keep your chicken flock safe from predators, snakes and other vermin with our 10mm x 10mm galvanised wire mesh and sliding bolt locks on ventilation and entry points. • Add our Wire Mesh Flooring, Auto Door Opener, and a Predator Sensor Light to ensure your hens are well protected. • Ventilation is essential for happy and healthy chickens. The Mansion™ Chicken Coop and Double Run creates the perfectly airy yet draught-free environment for your fabulous flock. • Your hens’ health will benefit from the meshed sliding windows, high ceilings and a capped off ventilation coop chimney. • The waterproof rubber asphalt roof panels is a magnificent water barrier, keeping your flock safe from the elements. • Rain falls off and away from your chicken coop’s oversized roof, keeping your hens dry and comfortable. • Gives you easy access to all parts your coop and run, along with our chicken run door and coop hutch door. • Makes access to under your coop hutch to let your hens out or top up their feed and water easy. Cleaning your coop hutch is a breeze with removable 30mm deep steel inserts in slide out cleaning trays. • Everything you need for assembly is included and clearly labelled. • Galvanised components ensure longevity and durability. • Stress free assembly with pre-drilled holes and pre-attached fittings including locks, hinges, latches, wire mesh and doors. A power drill, phillips head drill bit and a helping pair of hands is all you need to assemble your coop and run. Got a question? No worries! Our customer care team is on hand to help you with any assembly support you need. We provide coop and run assembly and painting services. We’ll even help you find your flock with our chicken sourcing service! Get in touch with us and we can take care of everything for you, from as little as $749*! 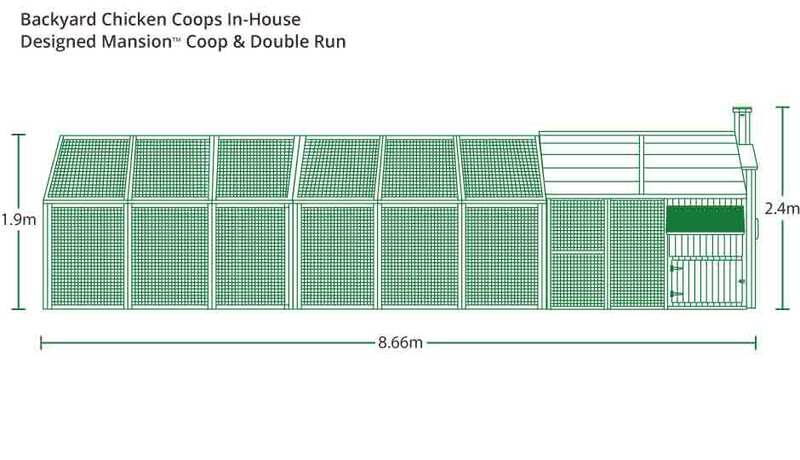 Find out all you need to know about this wonderful coop by downloading our product brochure. Full of detailed information, customer coops, painting tips & plenty more! Can I move this coop? Due to the size of our Mansion and Double Run, this coop and run has been designed to stay in the one permanent position. We find putting it on a solid, strong base is also best to keep it secure and safe. How many chickens can I fit in this coop? We fit our Mansion and Run’s with a strong galvanised wire mesh that is 10mmx10mm to help keep your chickens safe inside. We also use all proper locks and closes, to ensure no unwanted visitors can pry in. Can I put the runs side by side? With our Mansion Double Run, how you wish to set it up is totally up to you! However, please be aware, we have designed it to be installed end to end. We have many customers who will set them up next to one another, and it will just take a little extra work and a few more extra materials. Buy Now, Pay later, Credit cards, Debit cards PayPal & LayBy, we accept it all! Approval in minutes on OpenPay, it's like a take home layby! Simply pay a 20% deposit and installments over 3, 6 or 12 months. If you prefer a little more flexibility and zero deposit, ZipPay is the way to go with payments from just $80 a month*. Call and ask us today!